I can’t reveal much more at the moment but it’s certainly taken over my life a little! I go to sleep thinking about the design and I’ve done so many samples and amendments. I keep asking my husband and children their opinions on certain aspects and have really valued their honest opinions. The children can be brutally honest but that’s just what I need- when I see something in a design, they see something entirely different and it’s these extra eyes that I’m so grateful for! And then of course there’s the writing up of the pattern to do… I can’t wait to show you all what it is I’ve designed. In the meantime I finally finished the Granny Square blanket that has been on my hook for ages. The photo above was taken at sunrise- it’s always so lovely to be down on the beach early in the morning. I’m so pleased with the blanket. Being made of wool, it’s really cosy and is quite weighty. It’s for our camping trips and a little trailer caravan we purchased. I’m planning a blog post about that next week so you’ll be able to see the blanket in it’s new home! He’s so sweet and it was a fun little make. Last weekend we walked (as we often do) along the beach and I wore the Tunisian crochet shawl I made nearly a year ago- do you remember when this was on my hook!? I remember these first time round in the 80’s. 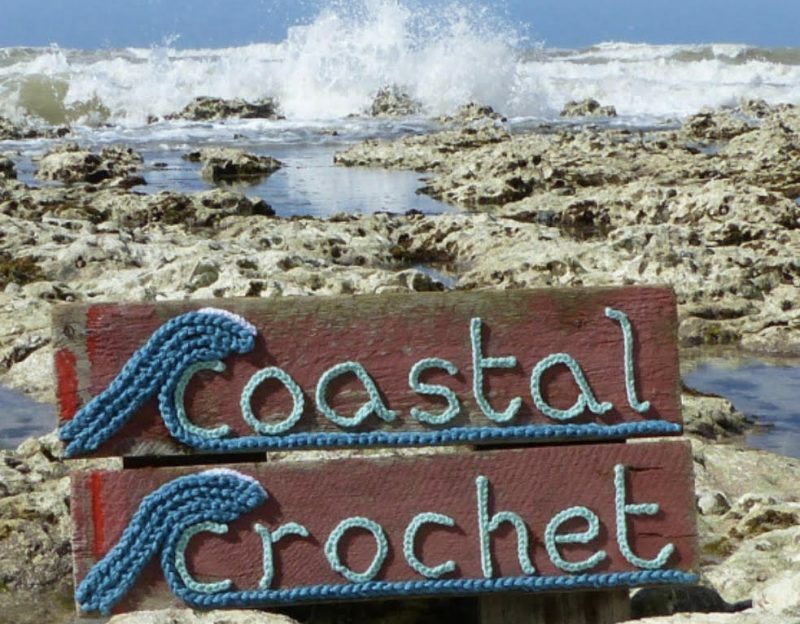 I’m loving it even more this time round…it’s perfect for taking my crochet on the go! I love that little dog! Do you know if you can you order the kits or just the pattern on line? It’s available as a kit from the Dutch shop, Hema. They have recently launched in the UK and here’s a link to the online shop. It’s a bargain at only £3! I will have to check it out today. Thanks! Well done Eleanora and how exciting. I can’t wait to see what you have designed for Hobby Craft. Your blanket is making me reach for my hook again! Looking forward to seeing your design. Creating patterns takes ages doesn’t! Lovely post. Love the dog, love the blanket, love the scarf! I do love the bag too, but I’d end up losing stuff through the holes. Look forward to the big reveal on the hobbycraft project. I adore the blanket 😍 I’m new to WordPress and just discovering all the great crochet blogs and yours is fab! I’m hopefully making a blanket for camping trips sometime in the future too! Ohh, I can’t wait for your Hobbycraft reveal. I’ll keep my eyes peeled!